Is it time to replace those old worn out rotten wooden handrails, are you tired of staining or painting every other year? 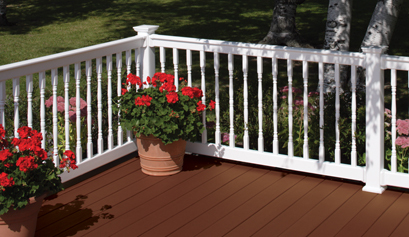 Mid-Atlantic has the solution, vinyl railings they come in 4 different colors; white, tan, khaki and gray and are available in 4 different styles. While you’re at it you might as well replace those warn out porch columns, they are now available in the country turned style and in regular 5X5 or 4X4 widths they have a load bearing capacity of 8000 lbs per post, never paint again. Our railings are backed by a lifetime transferable warrantee from Kroy Building Products. Our railing products meet or exceed the International Residential Code, so you can be sure that you're getting a high quality product. Call us now.